One of my very favorite things about my garden is being able to pick something and eat it standing right there. One of my very favorite things to pick and eat standing in my garden is a plum. One of the oldest plants (second oldest only to the wisteria) is my Santa Rosa plum tree. One of my favorite garden ceremonies is the Ceremony of the First Plum. One of my least favorite things to think about right now is that I need to take my plum tree out. It has been declining in the past few years, producing less and not growing as vigorously as in years past. 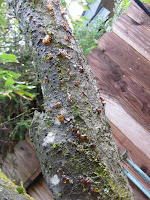 This summer I noticed a big problem...one of the larger branches was dead and was playing host to carpenter bees. Now the tree has sap seeping from many of the branches and I have had to make the difficult decision to remove the tree. I want to do it soon so that I can replace it with a bareroot tree or possibly two this winter. I need to have a Santa Rosa...I love them too much to not have one. But I believe if I prune the trees according to Dave Wilson's system that he calls Backyard Orchard Culture I should be able to have at least two if not three fruit trees. As every gardener knows, the compensation for losing a plant is being able to buy a plant. Or two. See, that almost makes me not sad. I will need to be careful when taking the tree down. Carpenter bees overwinter as adults in their wood tunnels and emerge in the spring. So the question is, what will happen when I take the tree down? Males are unable to sting so I'm not worried about them; it would be the females that scare me. In any case, I will proceed with caution and plan to store the wood in the side yard. That way they can remain in the limbs until spring if they like, at which time they will need to find new homes. And in a year or two I will get one last bit of enjoyment from my tree when I have a fire some cold winter night. Maybe I will think up a special Plum Tree Fire Ceremony involving a jar of jam made from the plums of that tree...I should probably set one aside now. I hope to be looking out the window at some new fruit trees when I have that fire. The weather has cooled and it is decidedly fall. Day time temperatures stay in the 70s or less and one night actually dipped just below 40 to all of 39. The begonia richmondensis and 4 other new tender begonias have been brought inside to continue blooming there for the time being. Many plants are actually happier and blooming better now...Rosa Flower Girl, for one, blooms almost all year but is prettiest in my opinion when the weather is cooler. Colors that bleach out in the heat of summer stay fresh and crisp when we reach fall. Above, Rosa Berries and Cream is just about to open...a day or two late for Garden Blogger Bloom Day. Scabiosa Butterfly Blue is starting a new round of blooms as well. Here's a late-breaking update...Berries and Cream decided to open after all once the day warmed up! Every Thursday Cindy at My Corner of Katy invites us to , as she says, "Pick 3 pictures of plants from your garden ... tell us about 3 books you've read that you want to share ... rant about 3 things that bug the heck out of you ... show us 3 pieces of garden art or 3 photos of egregious crimes against gardening ... you choose what your three will be. Just have fun, be creative and leave me a comment when your post is up!" Here are three blooms as my contribution. Above is Rosa Flawless, a mini-flora rose grown on its own rootstock on a compact plant. I got this free at a rose sale this summer and have it in a pot. Pastel pink and fragrant it is beginning to make me less scared of trying to grow any but climbing roses. I'm not particularly fond of most rose bushes but I find I'm making an exception here. This bloom, by the way, is a much deeper pink than the ones I've seen so far, courtesy of the cooler weather. Lavandula pinnata buchii blooms just about all year...I love it! The fact that it lives next to my Meyer lemon and often gets to share the piazza lights that keep the lemon happy on the coldest winter nights certainly contributes to its length of bloom time. My mom always had blooming jade plants in her Southern California garden in the winter. I'm wondering if this is the first time one of mine has actually bloomed! I've been afraid to move it for fear I would interfere with the blooms that have been developing, but it will soon move to a more protected spot for the winter, where all the other succulents have already migrated. All good things must come to an end, or so I've been told. Today was a day for planting winter vegetables...fava beans, three kinds of peas, baby greens and spinach. Seeds for swiss chard, radishes, beets and carrots had already been planted and with rain predicted for tomorrow I wanted to plant everything else on the list. As it headed past noon I thought I would have a lunch break before moving on to a bit of leaf raking and weeding. I remembered noticing that the last tomato plant still growing, a Nyagous, had an almost ripe tomato the other day and when I looked I decided it was the day for The Last Tomato of 2010. Lucky for me I had made some pesto yesterday and also happened upon some difficult to find burrata cheese at the market. This happy combination sounded like lunch to me! As I enjoyed this last tomato I recalled my friend Carol's Ritual of the First Tomato. I decided the last one deserved recognition, too, as we now head into the long dark days of no fresh homegrown tomatoes. At least I can take comfort in the fact that this was not the last strawberry...there is one more just beginning to ripen!